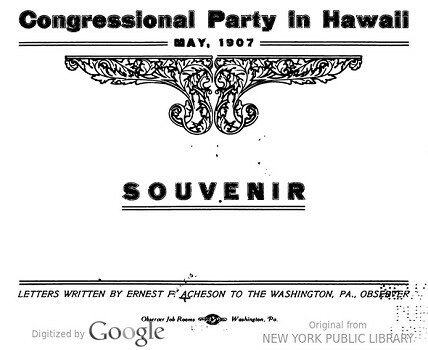 Ernest F. Acheson : Congressional Party in Hawaii, 1907. Congressional Party in Hawaii, May, 1907.
Letters Written by Ernest F. Acheson to the Washington PA., Observer. Observer Job Rooms, Washington, Pa., 1907. 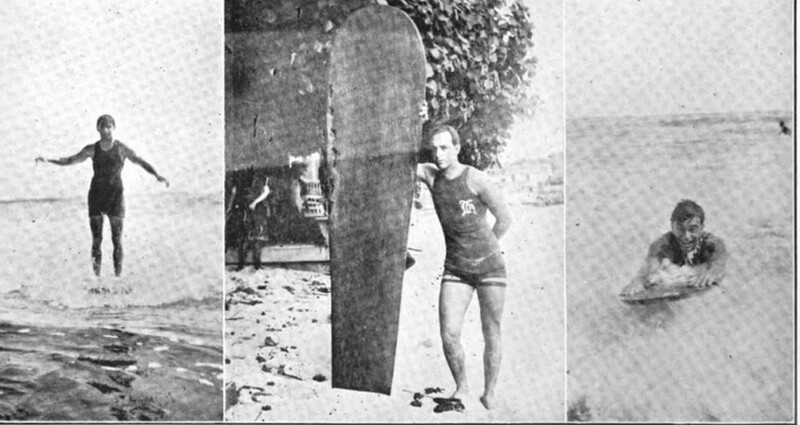 While Acheson's letters have no account of surfriding or even a mention of visiting Waikiki, there are three images of George Freeth included in the accompanying photographs. Freeth was Alexander Hume Ford and Jack London's surfing instructor, lauded in the later's famous article A Royal Sport, and is often accredited with introducing surfboard riding to California and the east coast of the US. Acheson notes that Hanalei Bay on Kauai is said to afford the best bathing to be found anywhere in the Hawaiian group. He writes of the islands' uninterrupted exposure to the northern swells and on the Big Island he observes the beginning of the construction of the breakwater at Hilo, which destroyed a number of quality surf breaks that were said to compare with Waikiki. Lihue, Island of Kauai, Hawaii, May 11, 1907. A day on the Island of Kauai was one of the delights of this enjoyable trip. Kauai is the oldest island of the group geologically, and it was the one upon which Captain Cook first set foot. Leaving Honolulu at 9 o'clock yesterday evening, we arose at 6 to look out on the beauties of the eastern end of Kauai. After sailing along its northern shore for two hours, we landed at Hanalei. We were entertained for breakfast at the summer residence of Albert S. Wilcox, a son of one of the early missionaries, who came here from Danbury, Connecticut, in 1835. The surf beats on the rocks at Laupahoehoe in a marvelous manner. To the north there is no land nearer than Alaska and the Aleutian Islands. The great ocean swells sweep in with resistless force even when the air is calm. A great storm a thousand miles away may cause a local disturbance on this shore and the swells rise until they lift landings which are 50 to 100 feet above the sea. The landing and boat house here are in a little cove no larger than a good sized room and can not be seen from the sea. Everyone must go ashore in small boats. In times of storm the waves submerge the landing and getting ashore is a dangerous business. Hilo, the Second City of the Group. Approaching Hilo from the ocean one is impressed with its picturesque location, the extent of fine country about it, and the size of its harbor, now really only an open roadstead. When the new breakwater is completed the Hilo harbor will be five times as large as that at Honolulu and the inner harbor quiet and safe in all weather. Hilo has a population of 5,000, but only about ten per cent of its people are white. The town is said to have been very quiet for several years past, with little growth, but at present it is showing signs of renewed activity. This is due to the belief that the building of the breakwater will lead to the extension of the railroad. a radius of 60 miles. Notwithstanding the limited area of country of which Hilo is the commercial center its imports and exports last year reached the handsome total of 200,000 tons. Geoff Cater (2016) : E.F. Acheson : Congressional Party in Hawaii, 1907.